John Stockton with his famous steer King Of The Road. John has raised great TL cattle since obama was shining shoes in Kenya. He has raised a complete conformation family of cattle in partnership with Bill & Sue Burton, now called Burton/Stockton Ranches. In the area of Cleveland, TX drive NW a few miles and pastures with beautiful Tl cattle are all over. This is where Tempter (over 85") serves on the throne. Many believe this is the largest quality herd of TL cattle in Texas and many others also agree with that, like myself. King Of The Road measured 102.5" T2T at maturity. He was so impressive in horn length, twist and body color Burton/Stockton processed 4 clones from him with one made into a steer to replace him with exact DNA and 3 were used for herd sires. The one used by Burton/Stockton was named Roger Miller. Several of his daughters and sons can be purchased of the lineage of this famous steer. King Of The Road's massive spread is beautifully mounted on the wall at the International Texas Longhorn Association world headquarters at Glen Rose, TX compliments of John and Helen Stockton. 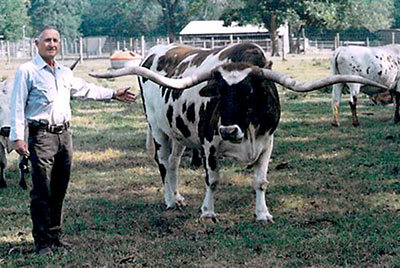 In the last dozen years big twisty horned Texas Longhorn steers have sold for some very smart prices in the $8000 to $15000 range. To own a real live walking eating DNA of the great American West is something above measure. At DCCI check the inventory at www.texaslonghorn.com for Exhibition Steer Inventory and select one of our own.